The Oriental rat flea is the primary transmitter of Yersinia pestis, the bacterium that causes bubonic plague. Plague was a major scourge of civilizations in past centuries. Today, small outbreaks periodically occur in the United States, largely resulting from the existence of the disease in populations of wild rodents. Bubonic plague is an acute infection in humans and various species of rodents, caused by Yersinia pestis (formerly called Pasteurella pestis), which is a bacterium transmitted by fleas that have fed on infected rodents. After a flea has fed on blood from the skin of an infected rodent, usually a rat, the ingested plague bacteria multiply in the flea’s upper digestive tract and eventually obstruct it. 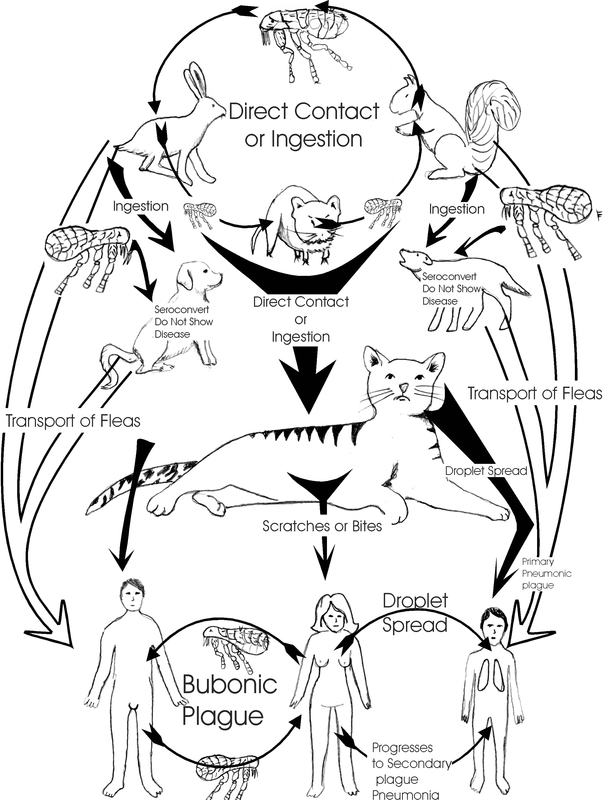 Then, when the flea feeds again, on a human or another rodent, the obstruction causes the freshly ingested blood to be regurgitated back into the bite, along with plague bacteria. The circulatory system of the bitten individual then carries the bacteria throughout the body. The first signs of illness in humans appear suddenly, within about a week. In a few hours the body temperature rises to about 40°C (104°F), and the victim becomes gravely ill, experiencing vomiting, muscular pain, mental disorganization, and delirium. The lymph nodes throughout the body, especially those in the groin and the thighs, become enlarged and extremely painful. The inflamed lymph nodes, called buboes (from which the disease gets its name), become filled with pus, and the disease spreads through the body by way of the infected bloodstream and the lymphatic system. In sixty-ninety percent of untreated cases, the infection is overwhelming and causes death within a few days. Respiratory transmission was mainly responsible for the historic plague epidemics that swept across entire continents and wiped out tens of millions of people. One such epidemic killed an estimated 100 million people in the Middle East, Europe, and Asia during the 6th century. Another epidemic occurred in the same regions during the 14th century -known as the Black Death. It killed one-fourth to one-half of the population of Europe, or about 75 million people. Small epidemics of bubonic plague continue to occur in widespread regions of the world, including the United States. The epidemics fail to spread beyond local outbreaks, however. This may suggest that less virulent strains of the plague bacterium have developed over the years and conferred a relative immunity to many people. That plague does reoccur supports its existence as a chronic disease among wild rodents. Flea traps were worn on chains around the neck under clothing in Victorian Europe. These intricately fashioned iron necklaces contained bits of fresh meat to attract the flea through a maze, which he could not escape. In ante-bellum times, slaves were painted with blood and made to walk through the plantation home to attract fleas to them before a party. Pans of blood were also placed under the verandah to attract the fleas away from guests. The first pesticide was pure nicotine called “Black Leaf Forty”.